Kami Tadayon is a entrepreneur, world-wide party promoter, founder and resident DJ of Lost Beach Club, ranked #44 in the world, according to DJ Mag. Inspired after attending an 808 State concert back in 1991, Kami has since devoted his life to becoming one of the most influential rave promotors in Latin America. His first and highly successful party was held in Los Angeles February 29th 1992, and he hasn’t looked back ever since. 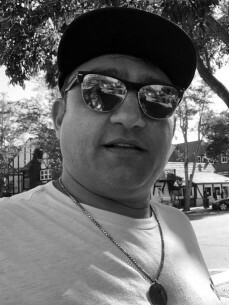 He continued to support the L.A. parties and then in 1996, he expanded internationally heading south starting rave scenes in El Salvador, Guatemala, eventually settling at his current home in Ecuador in 1998. While traveling and DJing throughout the beaches of Ecuador, Kami discovered a magical surf-town called Montañita, and he decided it would become the location that would host his lifetime project: a beachfront nightclub that would attract ravers from all over the world. He initially opened the venue as the “Centro de Arte de Montañita” in 2001. The space evolved into Lost Beach Club in 2010 when Kami began to amass what is now considered one of the largest Funktion One sound systems in the world in a club. Many of the great artists of the world’s underground house scenes have played ‘till the morning light on at least one of the 5 dancefloors decorated in bamboo and 3d graffiti on all the walls, including Damian Lazarus, Soul Clap, Steve Bug, Ben UFO, Miguel Campbell, Magda, The Martinez Brothers, Green Velvet, Stacey Pullen, Mr. C., Lee Foss, Tale of Us, Jamie Jones and many more. Kami has also expanded into tourism and business ventures including designing and running the luxurious Dharma Beach hotel, Paradise by Dharma, and Ezzio’s Pizza, just to name a few. He has received several awards for his collaborations with the ministry of tourism of Ecuador and abroad.